The Irish government has asked the Irish police to look at the findings of a report into corruption in the Republic's planning process. 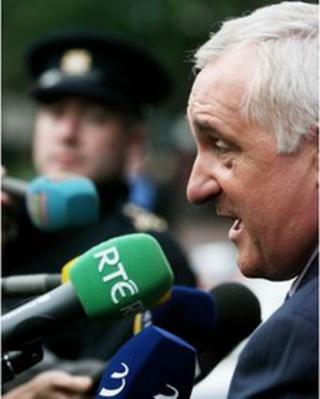 The Mahon Tribunal found that former Irish Prime Minister Bertie Ahern failed to truthfully account for a number of financial transactions. But the tribunal did not make a corruption finding against Mr Ahern. In a statement on Thursday, Mr Ahern said he had never "received a corrupt payment". In its report, the Tribunal rejected the former Taoiseach's evidence about the sources of money in his bank accounts. "After spending over a decade of inquiries and countless millions of euros, the Tribunal has not made - nor could it make - a finding to support the scurrilous and untrue allegation allegation that I had been given a corrupt payment by Mr Owen O'Callaghan," said Mr Ahern's statement, given to RTE. "I have never done anything to demean any office I have held. "I hid nothing. I gave the tribunal unfettered access to all my financial records, and after years of investigation, this tribunal has not made any finding of corruption against me. "I have told the truth to this tribunal, and I reject strongly any suggestion that I sought to mislead it." The tribunal, which ran for 15 years, made several findings of corruption against a number of witnesses. An Irish government spokesperson said: "The Government will refer the report to the Garda Commissioner, the Director of Public Prosecutions, the Revenue Commissioners and to the Standards in Public Office Commission. "A three-day Dail debate on the report will take place next week. "The Government will consider the findings and recommendations next Tuesday." The tribunal rejected Mr Ahern's evidence of "dig-outs"
The tribunal found that Mr Ahern failed to truthfully account for a total of 165,214.25 Irish punts passing through accounts connected with him. It also found that in relation to the B/T account, known as the Bertie/Tim account by bank staff in the Permanent TSB, Mr Ahern and his associate, Tim Collins, failed to truthfully account for 50,000 Irish punts lodged into this account between 1992 and 1994. In the introduction to the report, the judges say a number of senior cabinet ministers made sustained and virulent attacks on the integrity of the tribunal members. They say there is "little doubt" the objectives of these extraordinary and unprecedented attacks on the tribunal were to undermine the efficient conduct of the tribunal, erode its independence and collapse the inquiry. The tribunal held public hearings over 15 years, gathering evidence from more than 600 witnesses and the final report runs to 3,270 pages. Fianna Fail TD Thomas Byrne described the Tribunal's findings against Bertie Ahern as "very serious". He said it was "difficult to see" how Mr Ahern could continue as a member of the party, but he said that was a matter for the party's officer board, which is due to meet at 19:00 GMT on Thursday to discuss the matter in detail. Fianna Fail also requested a dail discussion on the report on Thursday.